When it comes to iSUPs, you have a lot of choices. However, most are not able to hold several people at one time because of a low maximum weight limit. 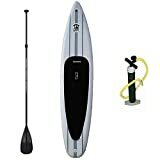 The Tower Xplorer inflatable paddle board changes the way that people look at inflatable paddle boards. It has a weight limit that beats all others. This makes it ideal for a lot of people. Perhaps it will even be your new, most favorite paddle board. One of the best things about the Tower Xplorer is the fact that it is extremely stable at 8” thick. It is also a feature that sets it apart from most other iSUPs that are 6 or fewer inches thick. 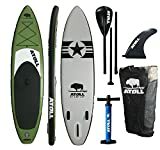 The extra thickness gives it a weight capacity of up to 700 pounds, which is also unique among inflatable stand up paddle boards. It is also 14ft long by 32” wide to give you plenty of room for gear and perhaps a pet or a friend. Even though this iSUP is thicker than others, it still folds up into the size of a sleeping bag. This ensures it is easy to store, easy to travel with, and more. As an added bonus, the inflatable and accessories only weigh 51 pounds. The iSUP is durable. It is made using military grade material to ensure that dings, punctures, and cracks are less likely to cause major damage. 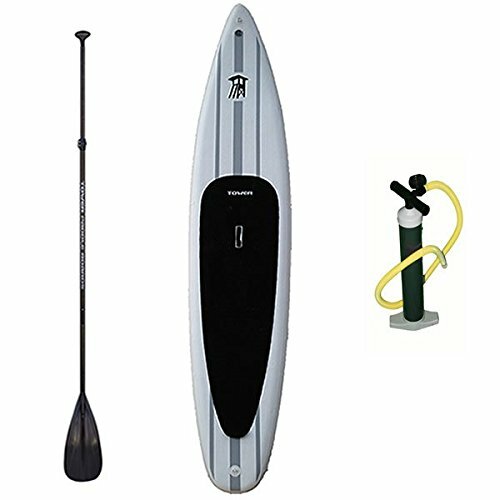 With your purchase you get a 3-piece adjustable paddle, the Xplorer, and a high pressure air pump. All you have to do is fill it to 10-11psi. The Xplorer is ideal for anyone who wants to paddle board. It is fast enough to be used as a racing board, but it is also perfect for touring. You can ride in tandem or solo. It is great for beginners. Overall, most people who purchase the Xplorer are very happy with their purchase. It is great for all types of activities and experience levels. It is a fast board that is stable. Some say that the more people you have on board, the better it is. There are even those who feel comfortable letting their kids play with the paddle board and most are happy to let their beloved pets ride on board as well. It is excellent for larger people because of the weight limit that is on it. Men who are larger than 6ft and perhaps weigh more than 200 pounds, can still enjoy having others along with them without worry about compromising the stability. Many claim that inflating and deflating the iSUP is easy enough with the hand pump and they do not feel as though they need to get an electric pump for it. Most agree that even though it is a fairly large paddle board, it does not take them too long to set it up. When in storage, it also does not take much room. It is recommended that you be prepared to upgrade the paddle when you purchase the Xplorer. As with most other paddle boards, the three-piece paddle does not provide quality. It also does not have a carry bag with it so it is a little less portable according to a few people. It is heavier than most other inflatables, but this does come from the size of it. Some also feel that the fins are a little difficult to put on the paddle board. The Tower Xplorer is great for most of the people who have purchased it. However, there are many who say that if you choose a smaller Tower you will be just as well off, unless you do want to carry a lot of people or supplies around with you. It is ideal for long outings and faster paced exercise. There are some minor issues with it, but most feel that they made a great purchase. This does not mean it is right for everyone.